Ashitaka wakes up again to find himself lying in a cave. San is sleeping beside him. He exits the cave, and finds Moro there. Moro tells Ashitaka that he has been unconscious for days, and San has taken care of him. Looking down at the beautiful forest under the moonlight, Ashitaka asks Moro if there is no longer a way to stop the war between humans and the forest. Moro answers that humans have already started moving in, and soon the forest will become a battlefield. Ashitaka asks if Moro intends to take San with her and let her be killed. Moro: "San is a daughter of my clan. She will live and die together with the forest." Ashitaka: "Let her go! She is a human!" Moro: "Silence, boy! Once, humans who invaded the forest threw a baby at me to escape from my fangs. That baby was San. Can you heal her misery? She cannot be a human, nor can she be a wolf. Poor, ugly, and dearest my daughter. Can you save San!?" Ashitaka: "I don't know. But I can be with her." "How? Are you willing to fight against humans with her?" Ashitaka answers no. That will only breed more hatred. But Moro tells him that there is nothing he could do. He returns to the cave to find San awake. She asks him if he could walk fine, and Ashitaka thanks her and Shishi Gami. San smiles, and goes back to sleep. Ashitaka watches her for a while, and goes to sleep. The next morning, when Ashitaka wakes up, San and the wolves are already gone. His belongings are neatly laid near him, together with some wrapped food. Ashitaka understands that this is a message from San for him to leave the mountain. Yakkul is waiting for him outside the cave. When Ashitaka mounts Yakkul, one of Moro's two sons appears, and leads them down the mountain. At the end of the forest, Ashitaka thanks him, and throws the Gyoku no Kogatana (obsidian knife) to him, telling him to give it to San. San and Moro are looking down from a ridge, where Eboshi's and Jiko Bou's men are busy working. Moro sees that the humans are setting up a trap for them by cutting down the trees to lure them in. The humans are burning something, and the terrible smell spreads so far that even San and Moro can sense it. San bids farewell to her mother. She is to join the boars to serve as the eyes for blind Okkotonushi, who can no longer depend on his sense of smell either. Moro says that San can choose another path, the path of going with Ashitaka, but San has made up her mind. The young wolf returns after seeing off Ashitaka, and gives Ashitaka's knife to San. 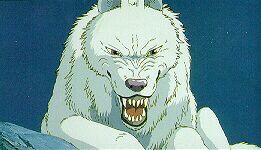 San wears it as a necklace, and together with the two young wolves, joins the boars to start a full force offensive against the humans. In the rain, Ashitaka walks down the mountain on Yakkul. He hears a sound like distant thunder. The rain stops and the mist over the lake clears up. Ashitaka sees black smoke running up from Tatara Ba. It is under siege from Samurais. The main gate is already broken, and the bodies of Tatara people are scattered all over. Ashitaka breaks through the encirclement of Samurais to approach Tatara Ba. Tatara people, mostly women, are holding out inside the main quarter of Tatara Ba. They tell Ashitaka that Eboshi and her men went to the forest to fight against the gods. Ashitaka tells them to hold on until he brings Eboshi back. Riding Yakkul, Ashitaka rushes back to the forest, with Samurais after him. Ashitaka manages to fend them off with his sword and arrow, but Yakkul is hit by an arrow. Ashitaka tells Yakkul to stay there and wait for him, but it keeps following him with a hobbled leg. Ashitaka reaches Eboshi's camp to find that it is covered with a sea of bodies - of men and boars. Ashitaka looks for San, but she seems to not be among the dead. The surviving men tell Ashitaka that the charging boars were blown up by the exploding mines. Then, although men were still on the ground, the Karakasa Ren threw off bombs to kill the remaining boars, and killed some of the Tatara men along with them. Ashitaka tells the Tatara men that Tatara Ba is under siege. They tell Ashitaka that Eboshi went to the forest of Shishi Gami with Jiko Bou and the Karakasa Ren, and Eboshi must have been deceived by them. They ask Ashitaka to help her. Ashitaka finds one of Moro's sons still alive, underneath the bodies of the boars. With help from the men, Ashitaka pushes a boar's body away to rescue the wolf. He asks the wolf to take him to San, where Eboshi must also be. Yakkul approaches the wolf, and they stare at each other as if to communicate. Yakkul stays behind, as Ashitaka and the wolf run into the forest. San, Okkotonushi, and another son of Moro are hurrying to the Shishi Gami's pond. Okkotonushi is badly hurt. Eboshi, Jiko Bou, and their men are secretly following them. Suddenly, a herd of boars appear. Okkotonushi is in raptures, thinking that his boars have come back to life. However, San realizes that they are humans wearing boar's raw hides. The humans have skinned the dead boars to fool Okkotonushi, so that he would take them to Shishi Gami! San tries to tell Okkotonushi that this is a human deception, but Okkotonushi, half mad, does not listen to her. He lumbers towards the depths of the forest, to Shishi Gami's pond. Desparetely trying to calm Okkotonushi down, San hears the howling of a wolf. She realizes that it is a message from Ashitaka. Okkotonushi finally loses all his strength and collapses to the ground. The "ghost" boars surround him. San tries to fend them off with her spears, but there are too many of them. From Okkotonushi's white body, black feelers are coming out. "Please!! Don't turn into a Tatari Gami!!" San desperately tries to clear the black feelers off Okkotonushi, but they keep growing. One of the men in the boar hides throws a stone at her, knocking her unconscious. On a cliff, Ashitaka hears the answering howling from the forest. The wolf tells him that San is in danger. They hurry down the cliff to the forest. San regains consciousness to find herself caught in the black feelers of Okkkotonushi. She sees that the black feelers are also coming out of herself. "No! I don't want to be a Tatari Gami!" San screams, but the black feelers keep sprouting, from her, from Okkotonushi. She is swallowed up by the black mass of Tatari/Okkotonushi. Ashitaka finds Eboshi and Jiko Bou advancing in the forest. He tells Eboshi to return to Tatara Ba immediately, since it's under siege. Eboshi: "So, you tell me to stop killing Shishi Gami, and start killing The Samurais instead?" Ashitaka: "No. Isn't there any way For both the forest and Tatara Ba to live together?" So saying, Ashitaka runs further into the forest, looking for San. Watching him go, Eboshi says that there is nothing she can do for Tatara Ba right now, and they have to continue their quest for Shishi Gami. Some of the men of the Karakasa Ren say to Jiko Bou that they can get rid of Eboshi now, but Jiko Bou grins and says that killing a god is a terrible crime, and he wants Eboshi to do the job.